It has been almost two years since the Duke of Ormond died as violently as he had lived. After years of abuse at the hands of her brute of a husband, Perdita, the widowed Duchess of Ormond, has had enough of allowing someone else to control her life. When threats from her husband’s unknown avenger escalate from private to public, she refuses to be driven from London. Perdita argues that the experience of her sister Isabella, the new Duchess of Ormond, (Why Dukes Say I Do) and of their friend Georgina Mowbray, now Countess of Coniston, (Why Earls Fall in Love) prove that eluding their tormenter cannot be accomplished so easily. She is also determined not to endanger others by her presence. Not even an attack on her person when she is riding in the park is enough to change Perdita’s mind. Lord Archer Lisle, youngest son of a duke and secretary to both the immediate past and current Duke of Ormond, has been in love with Perdita for years. He proves as stubborn in his determination to protect Perdita as she is in exercising her autonomy. If protecting her requires extreme measures, he will take those measures. He is also determined to show the widowed duchess just how wrong-headed she is in her belief that she can never again marry a man with whom she is in love. Manda Collins skillfully weaves together the ongoing mystery of the person behind the attacks on Perdita and the other women and the tension between Perdita’s love for Archer and her conviction that she cannot marry a man she loves. Fans of the earlier books will be happy to see that Isabella and Trevor and Georgina and Coniston make appearances in this one. Collins includes them in a way that seems organic and unforced. The mystery is resolved with some unexpected twists, one of which may hit the ick button for some readers, and, as befits a good romance series, all three couples are set to live happily ever after. 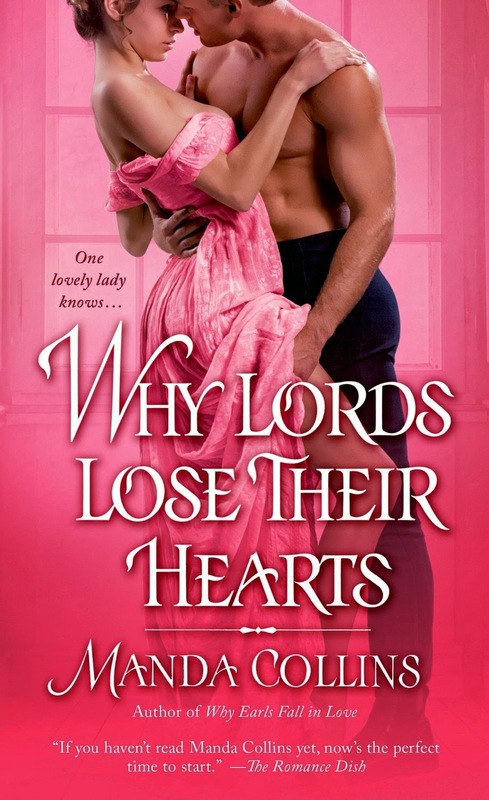 Why Lords Lose Their Hearts may be read as a standalone, but since it is the conclusion not just of a romance trilogy but also of the overarching mystery that runs through all three books, nuances concerning the mystery and relationships among the characters may be lost. Even readers who guess the avenger’s identity will be surprised at some of the revelations that accompany the denouement. I admit to being a wimpy reader, and so it should not be surprising that I found icky the particularly unpleasant death of one of the villains and one thread in the mystery. However, this response did not interfere with my appreciation of the characters. If you have been following the Wicked Widows, you definitely don’t want to miss this conclusion to the series. If you have not read the earlier books, I highly recommend the series as a stellar blend of romance and mystery. I can't wait to read WHY LORDS LOSE THEIR HEARTS! Thanks for the 5 star review! I've heard a lot of great things about the author's books, so I definitely plan on reading everything (from the debut trilogy to this). Thanks for the review! :D I like the mystery subplot too. I've not read the earlier books but this sounds like a series I would enjoy - thanks! I've enjoyed all of her books. Love the mystery-laced romance. Thank you for another comprehensive review. Unfortunately, I haven't been able to get to this series yet. However, since I wait until I have all the books before I start, this is perfect. I won't have to wait for the last book to come out. Sounds good.